Let's take a tour of the very beautiful Chalet Modello Lori 19, designed by Casedi Legno Sr, a group of designers and architects in Buenos Aires in Argentina. 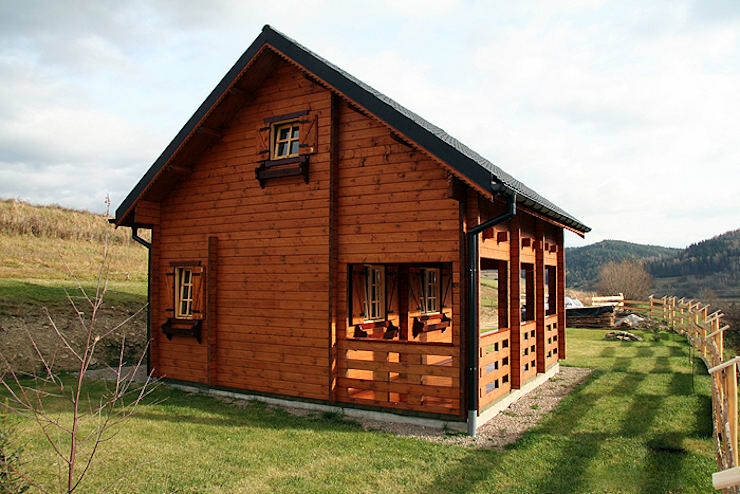 This chalet-styled home tucked in the middle of the woods is an oasis of peace and tranquillity. 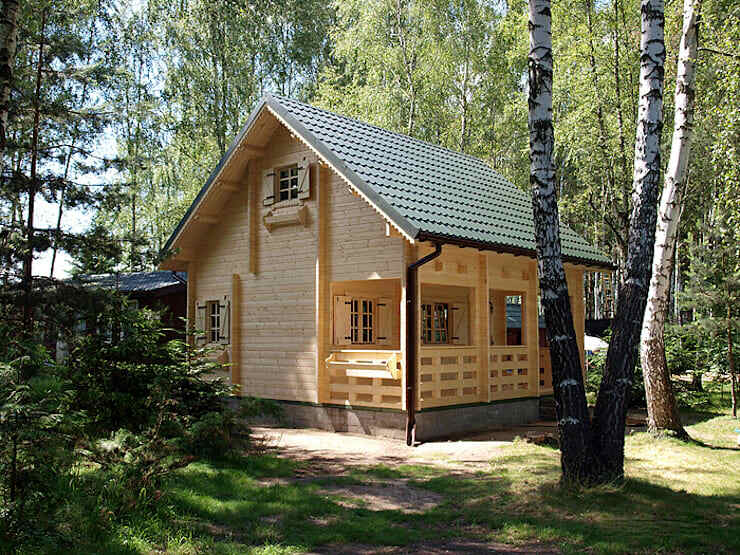 The abundance of green adds to the charm of the house and creates a mood for a happy vacation. If you look at it from a distance this cottage looks like one of those idyllic hideaways which will give you the unique scope and opportunity to enjoy your vacation uninterrupted. If you are enough intrigued, we can continue with our exploration. It is difficult to ignore the beautiful slope of the roof, the tiny window at the top and the quaint little windows and doors in the lower storey. If you were a part of a fairy tale, this indeed would be your home; and you would imagine that a small chimney on the top would complete the picture. But the absence of chimney has been compensated with an amazing balcony. Just imagine having your first cup of tea in that small veranda with the soft chirping of the birds smoothly cutting through the peaceful bliss. And if you step down from the veranda, you will encounter the beauty of the surrounding landscape. It is probably the best way to start your day! There is nothing elaborate about this cosy sitting area; instead, you will be enveloped with a feeling of warmth and happiness. Keeping with the simple rustic wooden theme of the house, you will notice a small center table in front of the five-seater sofa. The touch of green and brown in the cushions add to the charm and beauty of the place. The multi-coloured cover is quite a diversion but seems to be a deliberate choice if one looks at the painting at the wall. 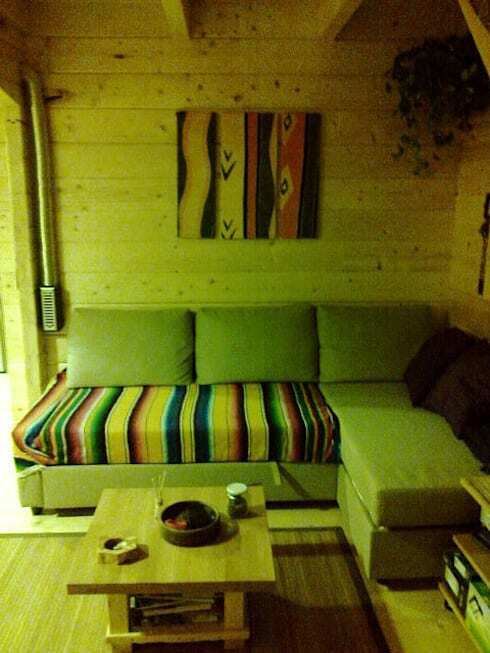 Although the painting is abstract, the colour scheme closely follows the bright spread on the sofa. The arched staircase which takes you from the lower storey to the upper floor is quite interesting. Upon closer look, you will notice that the staircase is strategically constructed with the space under the stairs cleverly converted to keep the television cabinet. 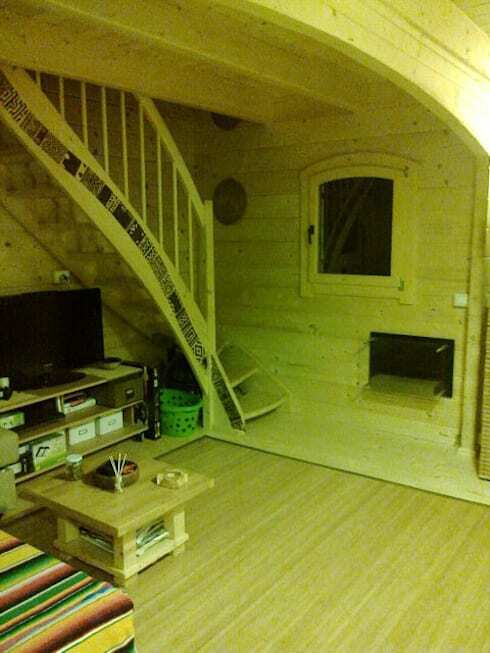 So, you can sit on the sofa and watch television or take a book from one of the cabinets and read it. Both ways, this space is perfect for lounging with your friends or spend some happy me-time. The railing or the banister has a wavy feel to it, and it will seem that you are moving through a spiralling staircase before you reach the top. The first thing that you notice about this room is how airy and bright it looks. There are two windows in the room and are enough to let in the fresh air. A half-wooden wall separates the seating area and the small dining space. A single sofa enough to accommodate three people stands in one corner with a high center table in front. In front of the table, you have a fenced area which leads directly to the chimney or fireplace. As you look closer, you will understand that this is the perfect place to enjoy your warm cup of cocoa on a silent wintry night. And as you snuggle up inside the blanket, the fire will keep you warm and happy. Think that you have got enough of the house? Well, you can step outside and take a deep breath. The fresh-farm like smell will make you instantly rejuvenated. A wooden fence, typical of a quaint English cottage surrounds the house. Take off your shoes and step on the soft green blanket; you will feel that tired bones are instantly relaxed and rejuvenated. The surrounding landscape is extremely cheerful and you will feel an instant connection with it. There are some places which can make you instantly rejuvenated! 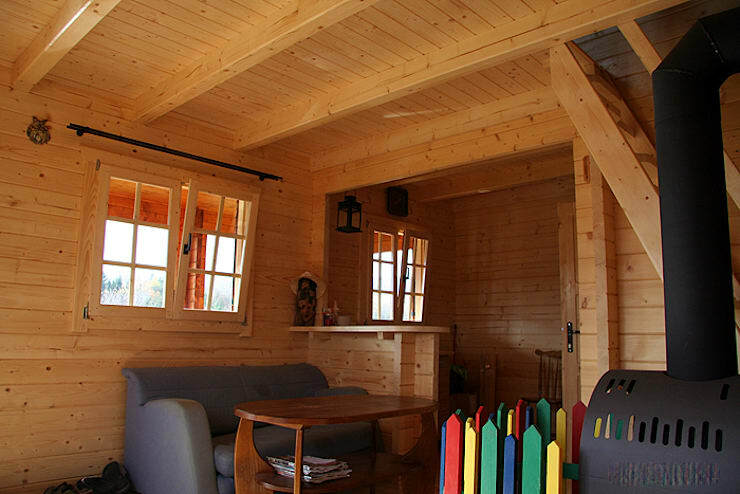 Chalet Modello Lori is one of them; it will make you feel as if life is a continuous vacation.